Though Daniel Craig’s clothes in Skyfall and Spectre follow the current 1960s-inspired fashion trends, the clothes have some fundamental differences from the way Sean Connery dressed as James Bond in the 1960s. Craig’s outfits may seem very much like what Sean Connery wore as James Bond 1960s at a glance, but at their heart they are more different than they are alike. This comparison will only use the suits and corresponding accessories that Connery wears in his five 1960s James Bond films and the suits and corresponding accessories that Craig wears in Skyfall and Spectre, so as to as to provide the most direct comparison between their clothes. Sean Connery’s clothes in the 1960s follow the basic style of English tailoring with a few cosmetic concessions to 1960s fashions. Sean Connery’s clothes were provided by traditional English clothiers, who were not overly concerned with current fashion trends. Daniel Craig’s clothes are more concerned with fashion through fit, though they still have a traditional angle. Sean Connery’s suits are from Anthony Sinclair of Conduit Street in London, whilst Daniel Craig’s suits are from American fashion designer Tom Ford—who is inspired by English styles—in collaboration with Skyfall‘s and Spectre‘s costume designer Jany Temime. The suitings (the cloths that suits are made from) are what Connery’s and Craig’s clothing have more in common than other parts of their suits. Anthony Sinclair was a pioneer amongst English tailors in his use of lightweight suitings. 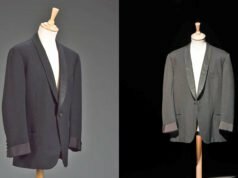 For English tailors in the 1960s, a lightweight suiting may have been 11 to 12 ounces, not the 8 to 9 ounces that defines lightweight suitings today. Sinclair tailored suits for Sean Connery in lightweight worsted suitings as well as in silk, wool and mohair blends and woolen flannel, which would have been heavier than the lightweight worsteds. Daniel Craig’s suitings are lightweight by today’s standards, which follows the same lightweight idea that Connery’s suits did. Craig wears worsteds as well as blends with mohair and silk. He does not wear flannel suits, which were a staple of Connery’s wardrobe. Connery mostly wore grey suits along with a number of blue suits and the occasional brown suit. Craig’s suits in Skyfall and Spectre are all various shades of grey and blue, with the exception of a black suit for a funeral in Spectre (which Connery also wore to a funeral home in Diamonds Are Forever in 1971). In Spectre, Craig wears two suits in vivid shades of blue, which are very fashionable today. Though they also were very fashionable in the 1960s, Connery did not wear them. As for patterns, Connery’s and Craig’s suitings share many of the same, such as pick-and-pick (sharkskin), herringbone and various types of glen checks. Though they both wear striped suits, the types of stripes they wear differ. Craig wears suits in Skyfall and Spectre that feature rope stripes and track stripes, respectively, whilst Connery wears chalk stripes and shadow stripes in From Russia with Love and Goldfinger, respectively. The striped suit is more important to Craig’s wardrobe than it is to Connery’s wardrobe, considering how many more suits Connery wore that were not striped. Whilst Connery wore both modern and traditional suitings for the 1960s, many of Craig’s suitings pay homage to much of what Connery wore in the 1960s. For this comparison, I will juxtapose Sean Connery’s Anthony Sinclair suit jackets against Daniel Craig’s Tom Ford O’Connor jackets, as the Tom Ford Windsor model with its wide lapels model is not as relevant to a 1960s comparison. Sean Connery’s jackets have the defining late 1950s and 1960s characteristic of narrow lapels, at under 3 inches wide. Daniel Craig’s jackets have lapels of a similar width, though because he has a smaller chest the lapels look wider in comparison to the chest and shoulder widths. The pocket flaps on both Connery’s jackets (when they have pocket flaps) and Craig’s jackets are narrow to harmonise with the lapels. This is where the similarities end. Apart from the lapel width, the jackets differ considerably in cut, style and fit. Lapel width is cosmetic whilst the silhouette of a jacket is what truly defines it. Despite Connery’s and Craig’s lapels being a similar width, the gorge height is different. The gorge is the seam where the collar meets the lapels. 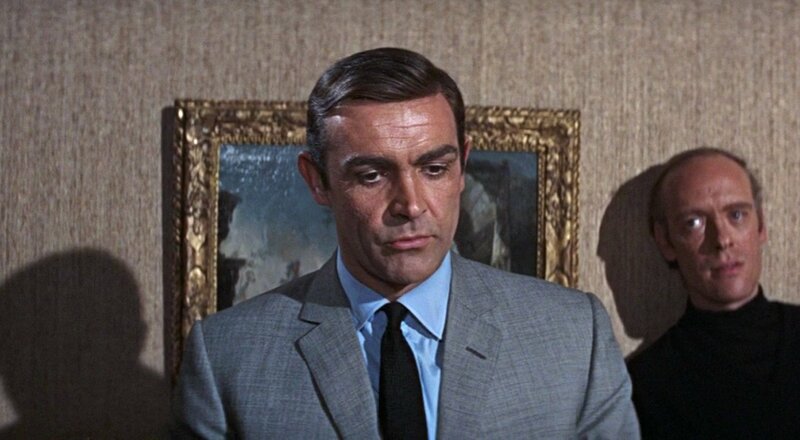 There is no one height that the gorge must be, but on Connery’s suits in Dr. No, From Russia with Live and Goldfinger the lapel notch sits around the same height at the end of his shirt’s collar points. In Thunderball and You Only Live Twice the gorge is a little higher. On Craig’s suits the gorge height is higher still, following a trend of the past decade. This has the positive effect of lengthening the torso and helps a shorter jacket to not look so short. Though both Connery’s and Craig’s shoulders are punctuated by roped sleeve heads, the overall shapes of the shoulders are very different. The shoulders on Connery’s jackets are very soft with little wadding, and they are wide to allow the sleeves to drape cleanly over Connery’s deltoids. Craig’s shoulders have a firm pad for a straight line and are narrow. The chest on Connery’s jackets are very full, sometime with a little drape (folds) on the sides. This allowed a pistol to be concealed in the chest. As the 1960s went on, the chests were tailored with a bit less fullness. The chest of Craig’s jackets is tailored with a full shape, but it fits too tightly and causes the chest of the jackets to pull open. The waist on Connery’s suits is gently suppressed for an elegant silhouette, whilst the waist on Craig’s suits is aggressively suppressed for an aggressive look. The too-tight fit of Craig’s suits is an element purely of today’s fashions than 1960s fashions and is perhaps the most significant difference between Connery’s and Craig’s suit jackets. Whilst the ‘bum-freezer’ jacket, which was not long enough to cover the buttocks, was trendy in the 1960s, Sean Connery’s jackets were always a classic, elegant length that fully covered his buttocks. Considering that Bond did not care for the Beatles, the bum-freezer would have been a trend too far for Bond. It also may not have been to the taste of his off-Savile Row tailor Anthony Sinclair, who overall preferred a traditional cut. Craig, on the other hand, goes for the bum-freezer jacket, which has been trendier than ever during the past few years. His short jacket length is by no means extreme, but it’s an inch shorter than it should be. Connery’s suit jackets are all button two, with the exception of a button one suit in You Only Live Twice. 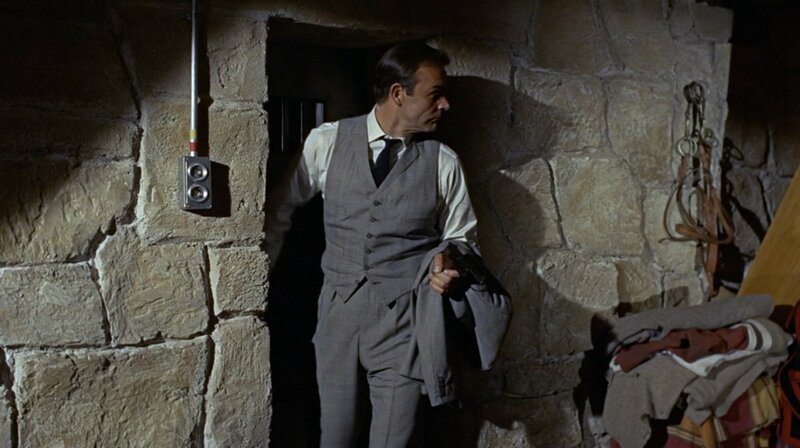 The button stance (where the fastened button falls) started out at a medium height in Dr. No before it was lowered for From Russia with Live. From then on the stance is very low, which was not a popular trend in the 1960s, and by You Only Live Twice in 1967 it was an outdated look. Craig’s O’Connor model suit jackets are all button three, with the lapels rolling at the top button in Skyfall and down to the middle button in Spectre. The lapels rolling down to the middle button in Spectre effectively give the jackets a button two look, but the heritage of that style is American or Italian and not English, as Connery’s suits purely were. It is odd that Craig’s suits are all button three, especially since the button two style has been a far more popular style this decade. Craig’s button stance is low in relation to the length of the jacket as a whole like Connery’s button stance is, but it’s a medium button stance in relation to where it hits his waist, for a nice balance between the jacket looking proportionate and the jacket being able to move well with the body. The sleeves on Connery’s jackets are tailored full in the upper arm but tapered to a narrow opening. The sleeves on Craig’s jackets are narrowly fitted the whole way down the arm, but they’re wide enough at the upper arm so not to create divots. 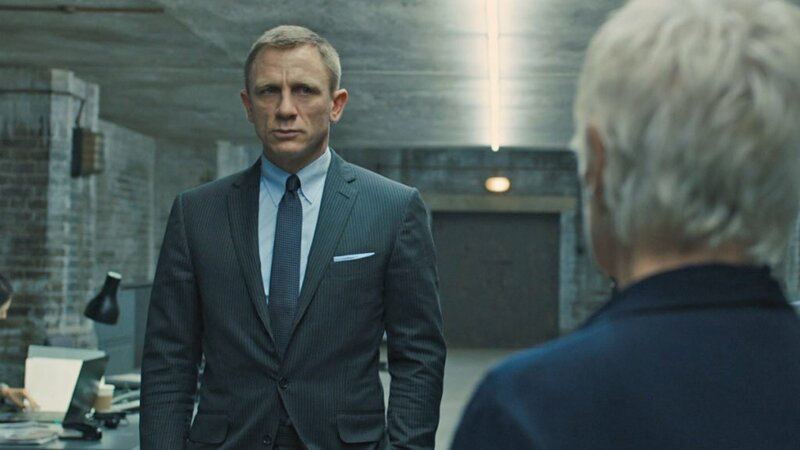 Connery’s sleeves are always finished with four buttons, whilst Craig’s sleeves are finished with three buttons in Skyfall and four buttons in Spectre. Connery’s sleeve buttons are all created equal, and he always keeps all of them fastened. On Craig’s sleeves, the last buttonhole is longer than the others, and Craig always leaves it open. Craig’s method of showing off his working cuff buttons would have been considered flashy by Connery’s more conservative Bond. Connery’s suit jackets have either double vents, a single vent or no vent. A single-breasted suit jacket can take any of the styles (single vents, on the other hand, are unusual for a double-breasted jacket), so Sinclair gave Connery a variety, perhaps sometimes following yearly trends. All of Craig’s suit jackets—as well as the dinner jackets—in Skyfall and Spectre have a single vent, which must be Jany Temime’s preference. Considering how double vents are the most popular vent style today as well as the vent style that has been associated with English tailoring for almost the past 50 years, Temime’s choice for a single vent on everything Craig wears is unusual. In the 1960s, the hip pockets on Connery’s suit jackets are almost always straight, intermittently with flaps but more often just jetted. The exception to this is that the country suit Bond wears to the office in Goldfinger has slanted hacking pockets. That suit and the famous grey glen check suit in Goldfinger also are Connery’s only two suits to feature ticket pockets. The breast pocket on Connery’s jacket is the classic straight welt, placed lower on the chest than what would be typical today. Craig’s O’Connor suit jackets always have slanted hip pockets, but on a gentle slant, with flaps. The breast pocket is a curved ‘barchetta’ welt pocket, which is a hallmark of many of the finest Italian tailors. Like their suit jackets, Sean Connery’s and Daniel Craig’s suit trousers differ considerably in their cuts. 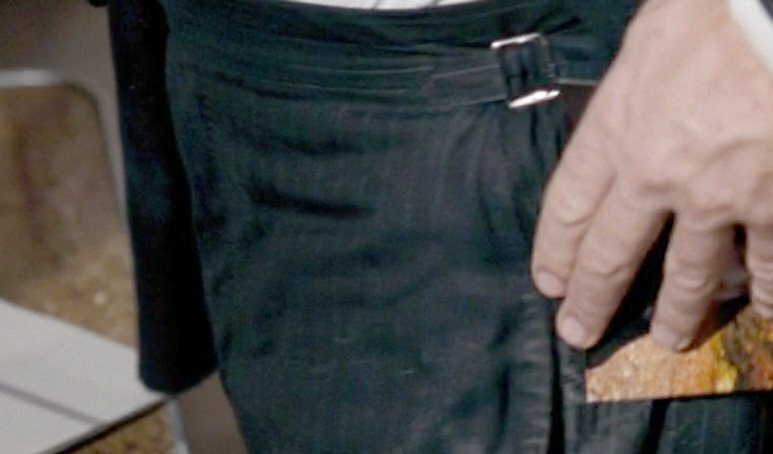 Connery’s trousers are cut with a high rise to the waist, which was lowered slightly after Dr. No but still kept high. The front has double forward pleats, which face inwards in the English tradition. The legs are full at the top but taper down to a narrow hem. Connery’s trousers were traditional and did not follow the trends. By contrast, Craig’s ‘drainpipe’ suit trousers have a lower rise that sits on the hips, and his trousers have a tendency to sag. The legs have a very close fit in the thighs and are straight from the narrow knee to the narrow hem. Craig’s style of trousers was popular in the 1960s, but like the ‘bum freezer’ jacket was too trendy and young for Bond. The details of Connery’s and Craig’s suit trousers are very similar, as Tom Ford is considerably inspired by English tailoring. Their suit trousers both have a self-supporting waist that neither takes a belt nor requires braces. Connery’s trousers have ‘Daks tops’-style side-adjusters, which have a tab on each that can fasten to a choice of three mother-of-pearl buttons. The tabs are connected to a band of elastic that is hidden inside a tunnel in the back of the waistband. Craig’s trousers have another style of self-supporting waist, which is made up with straps on each side that fasten with a slide-buckle. Craig’s style of side-adjusters is as equally English as Connery’s style is. The waistbands of their trousers fasten with a hidden clasp at the end of a square waistband extension, which ensures that the front of the trousers straight. The legs of both Connery’s and Craig’s suit trousers are usually hemmed with tall turn-ups. Contrary to popular opinion, Craig shows that pleats are not required for turn-ups. 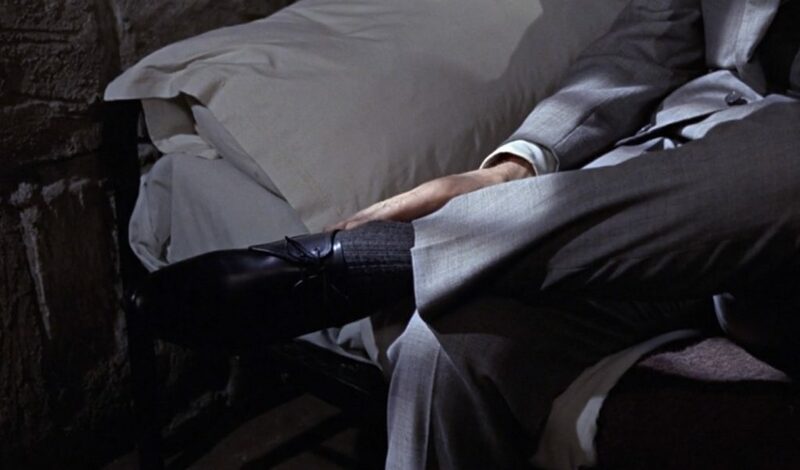 Connery shows that the opposite can also work in Goldfinger, when he forgoes the turn-ups on his pleated suit trousers. Craig’s Windsor-model suit in Spectre does not have turn-ups on its trousers. Both Sean Connery and Daniel Craig wear three-piece suits occasionally, and Connery wears an odd waistcoat with one suit in Goldfinger. Craig wears two waistcoats in Spectre, and they each have six buttons with five to button. The bottom button does not line up with its corresponding buttonhole, so it cannot fasten. The waistcoat has four welt pockets in the curved ‘barchetta’ style. 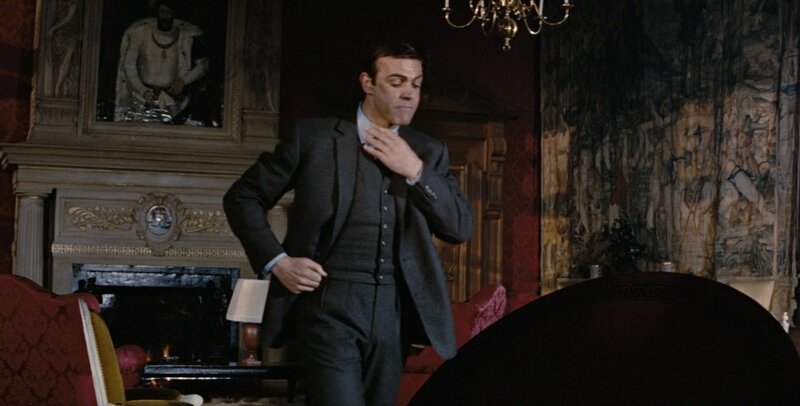 Two of Connery’s waistcoats in Goldfinger match this style (with straight welt pockets instead of curved), and a third waistcoat in Goldfinger adds lapels whilst otherwise following the style of the other waistcoats. In Thunderball, Connery wears two suits with that have the fashionable straight bottom of the time, and all six buttons can fasten on these waistcoats. Though Connery wears a variety of waistcoat styles, Craig’s waistcoat style is practically identical one that Connery wears. This is, however, a small similarity when comparing the cuts and styles of the suits overall. Sean Connery’s shirts in all of his Bond films but Goldfinger are made by Turnbull & Asser. Daniel Craig’s shirts are from Tom Ford. Connery’s and Craig’s shirts differ considerably, though they both mostly wear shirts of basic cotton poplin and they both wear many light blue shirts. Connery wears mostly various shades of light blue along with some cream shirts, and in Goldfinger he wears white shirts with faint grey broken stripes. Craig wears an even mix of light blue and white shirts in Skyfall and Spectre. There are few similarities amongst the styles of the shirts. Craig does not wear the classic English collar styles that Connery wears. Connery’s shirts in Dr. No have a cutaway collar whilst the rest have variations on the classic English spread collar. 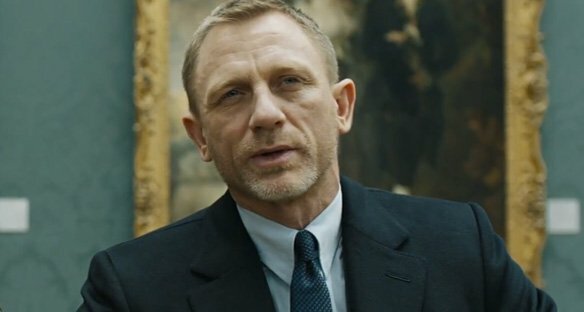 Craig’s shirts in Skyfall have a tab collar whilst in Spectre they have a point collar. The point collar that Craig wears with his black suit in Spectre has eyelets for a collar bar. Though Craig’s tab collar in Skyfall was previously a part of 1960s fashion, never before was it a part of Bond’s wardrobe. Temime’s choices for Craig’s collars are quite peculiar; Connery’s spread collar is more popular today than Craig’s tab and point collars are, and the spread collar would flatter Craig’s angular jawline very well. The tab collar is especially fussy for James Bond, particularly Daniel Craig’s Bond who can bother to put his flat together. 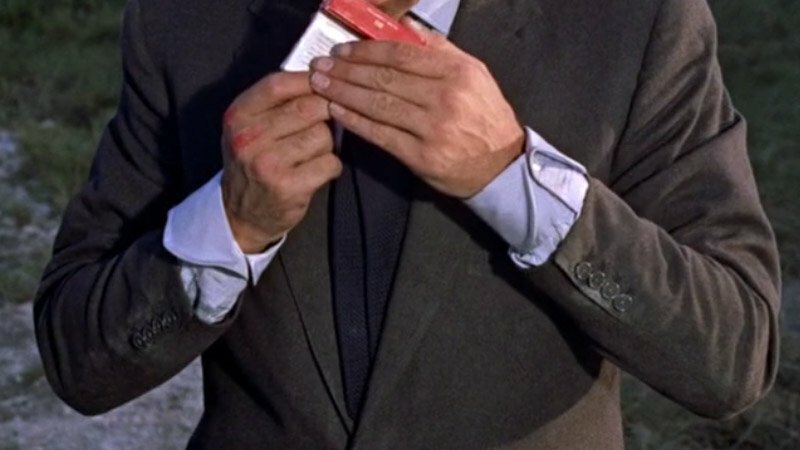 Most of Connery’s shirts have two-button cocktail cuffs, except the shirts in Goldfinger have double cuffs (french cuffs). Most of Craig’s shirts have double cuffs, except the shirt that he wears with his black suit in Spectre has cocktail cuffs. Though both Connery’s and Craig’s shirts have plackets, they are stitched differently. Connery’s Turnbull & Asser plackets are done in the classic Jermyn Street style: narrow with the stitching 3/8″ from the edge. Craig’s Tom Ford shirts have the more standard style of placket: stitching 1/4″ from the edge to match the stitching on the collar and cuffs. Connery’s Turnbull & Asser shirts have a much fuller fit than Craig’s Tom Ford shirts, but both are tapered in the back with darts. Sean Connery’s tie wardrobe consists of navy, black and brown grenadine and knitted ties. Daniel Craig’s ties are all grey or blue in patterns or solids. In Skyfall the ties are small neat woven patterns, two of which bring to mind the grenadine ties that Connery’s wore. Most of the ties in Spectre are in a solid repp weave, but Craig also wears a brown knitted tie and a black-on-black weave textured tie. The Spectre ties being solid recall Connery’s preference for solid ties, though the weaves are different. Connery’s grenadine ties are mostly around 2 3/4 inches (7 cm) wide and his knitted ties are a bit narrower to match the width of his lapels, whilst Craig’s ties are mostly just under 3 inches (7.5 cm) wide, which is a little wider than the width of the O’Connor model’s lapels. 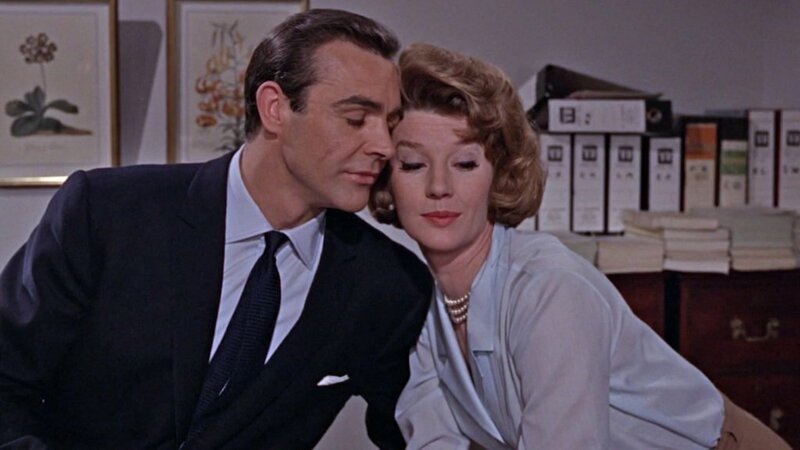 Both Connery and Craig typically tie their ties in a four-in-hand knot, except for Connery’s windsor knots in Dr. No. 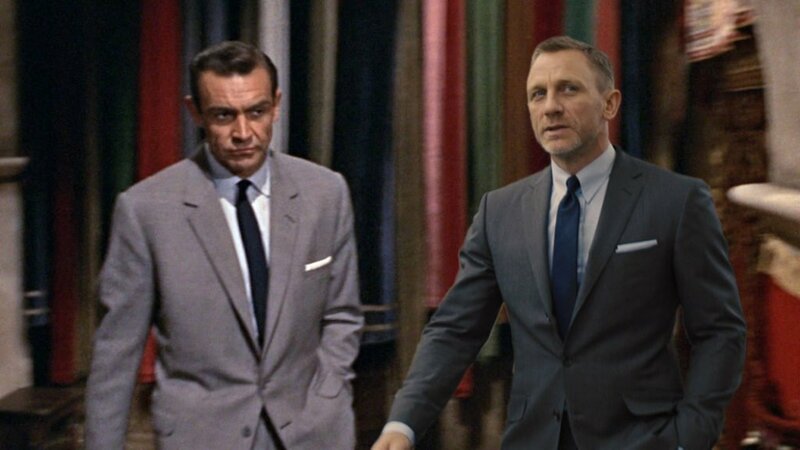 One of the ways the Sean Connery’s and Daniel Craig’s dress comes together is in the pocket squares. 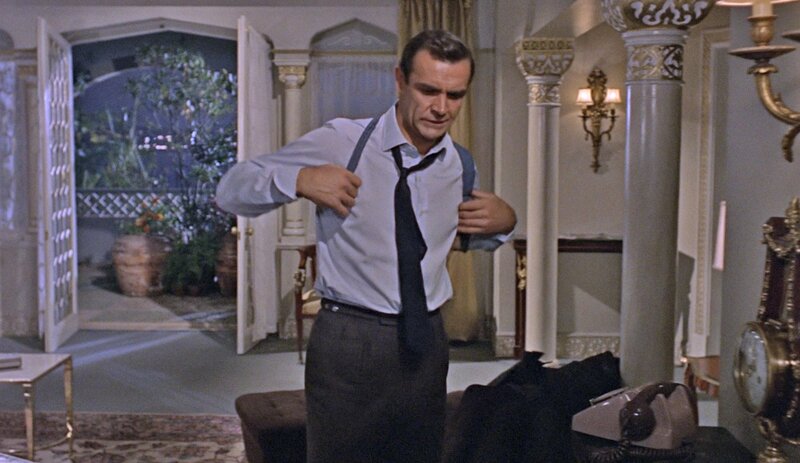 Both wear handkerchiefs in a TV fold, though Connery only wears pocket squares in his first three Bond films: Dr. No, From Russia with Love and Goldfinger. The revival of pocket squares in TV folds today is a reflection of the greater 1960s revival. Whilst Connery’s pocket squares were always white, Craig’s always match the colour of his shirt, giving his pocket squares a more coordinated look compared to Connery’s more nonchalant look that avoids a perfect match. Sean Connery and Daniel Craig both wear a variety of shoe and boot styles with their suits, always in black. Connery starts off wearing only traditional three-eyelet derby shoes but then expands his shoe wardrobe to include more fashionable slip-on shoes and short boots that use elastic. Craig also wears both shoes and boots with his suits in Skyfall and Spectre, including some overlap with Connery’s styles. His shoes in Skyfall are the Crockett & Jones Highbury model, which is a three-eyelet derby shoe similar to what Connery wore in his first three Bond films. In Spectre his shoes are the Crockett & Jones Norwich model, which is a five-eyelet derby shoe. Though it keeps with derby style, the five-eyelet variant has a considerably different look from the three-eyelet. Craig’s boots include the Crockett & Jones Tetbury three-eyelet chukka in Skyfall and the Crockett & Jones Camberley double-monk boot in Spectre. Though Craig’s boots are in a completely different style than Connery’s boots are, the idea of wearing ankle boots with a suit is the same. Tall boots with a suit went out of fashion in the early 20th century, but ankle-height boots with a suit returned to fashion in the 1960s. After the 1960s the boot fashion went out and never came back. Craig wearing boots with two of his suits is directly inspired by the 1960s rather than by the current corrupted revival of 1960s fashions that defines his suits. Sean Connery’s and Daniel Craig’s dress have much in common, from their colour schemes to their shoe styles to their pocket squares. Craig’s clothes are certainly inspired by Connery’s as a whole, but the finer points differ considerably. To the untrained eye, the similar colours and narrow lapels on both Connery’s and Craig’s suits makes them look very much alike, but Connery and Craig ultimately wear very different suits with different cuts for different eras as it’s the silhouette that truly defines a suit. The fit and style of Craig’s suits are indeed partially inspired by the 1960s, but the fit and style are not from Connery’s 1960s. Connery’s suits are for a more conservative man of the 1960s, whilst Craig’s suits are for a fashionable man of the 2010s. Craig’s clothes still mostly follow styles that are still acceptable in a conservative environment whilst pushing the boundaries of today’s fashion by the fashionably poor fit of his suits. Craig’s outfits pay homage to Connery’s in many ways, but Craig’s Bond does not dress for Connery’s Bond. Craig’s Bond does not dress to be the same conservative man that Connery’s Bond was. Craig’s Bond dresses to be a modern man of today. Despite the similarities between Connery’s and Craig’s outfits, the suits themselves are very different because they aim to achieve different goals. Even though Connery’s trouser have pleats they don’t look baggy at all. With rumours pleats will come back into fashion, I would happily wear double forward pleats and tapered legs like Connery’s trousers. I think Connery’s more natural shoulder line and wider then what Craig’s jackets have is more pleasing to the eye. Matt do you think Craig could wear a soft shoulder like Connery with a little wadding and bit wider then his Tom Ford narrow shoulders ? Craig could indeed wear a shoulder a bit more like Connery’s. Strange, Craig’s suits from Skyfall and Spectre and Connery’s suits in all movies except Diamonds are Forever are very similar. I think you mentioned before that Sinclair preferred a 2 button as opposed to a 3 button. Craig probably does a 3 roll 2 because it’s a bit more sophisticated and out of the ordinary compared to a normal 2. 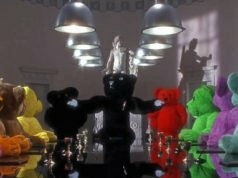 However, when it comes to Craig’s suits in Casino Royale and Quantum of Solace, they are still a bit similar to Connery’s in Diamonds are forever, but there are some distinctive differences. I think that the shoulders on Craig’s suits were a lot stiffer and with more padding, also because Craig wore predominantly three button and Connery wore 2. – First and foremost it is not a question of trends but of fit. A jacket shorter than usual has always been applied by tailors but only on man of a shorter height because it helps stretching the body (optically). But on a man as tall as Connery it would be absurd and that’s exactly what the current fashion trend (“bum-freezer” as you call it) actually is: It always makes tall men look ridiculous (like grown-ups in their outworn school uniforms or in boy’s suits). In the last years one could see many men in such laughable outfits (often in combination with trousers too short – horrible). A pity that Craig had to join them. When it comes to choosing a suit’s cut the wearer’s proportions should be the sole criterion to find the one appropriate. I keep coming back to the O’Connor silhouette. Such a small amount of changes improved it so much after Skyfall, with regard to the silhouette. The Skyfall suits look so off in almost every shot, and when he wear them open the three button stance makes them look like miniature clothing for an action figure, and the trousers look simply weird and unnatural in their taper. I can’t deny that now Temime, Craig and Tom Ford managed to achieve the cut they were aiming for in 2012, I do find it an impressive look, however faddish it is. This shot demonstrates what I mean. Everything looks… off. The bottom line is that Anthony Sinclair is a bespoke tailor that is nonsensical and builds a suit according to the individual he is dealing with, in this case Sean Connery. On the other hand you have Tom Ford who is fashion designer that creates suits with cheap gimmicks that after a few years get boring. Not to forget I believe that Tom Ford stole the cut for his Windsor suit from bespoke tailor Timothy Everest. In addition, I overheard from a few people that Tom Ford suits only fit a particular body type and that by wearing a Tom Ford suit a persons posture and the way he stands changes. Too me that sounds nonsensical; however, if there is some truth to these comments then Tom Ford has got the entire idea of suit backwards. A suit is supposed to be created such that an individuals flaws are hidden by expert tailoring to make the person look flawless. If I have to change my posture or the way I stand I would take the Tom Ford suit and use it as kindling for my fireplace. Poor fit notwithstanding, I much prefer the Tom Ford cut to Sinclair’s. And based on Matt’s commentary, Ford’s suits, although not bespoke, are likely of a higher quality than what Sinclair was able to make for Connery. I appreciate the homage to Connery’s Bond look that has been prevelant during the Craig years. I think they’ve struck the proper balance. It’s overt enough that casual viewers can see the similarity, but those of us who look for more subtleties can easily spot the nuance. If not for the lousy fit, the Spectre suits would probably be my favorite of the series. YMMV between bespoke such as Anthony Sinclair or made to measure such as Tom Ford. In my opinion the case of the jacket sleeve being ever so slightly longer and larger on the left hand is very obvious on people who wear Tom Ford (including the man himself). For me ultimately the goal is to have a wardrobe that is entirely made up of Bespoke suits. Currently, as a university student that goal is quite difficult; however, in the long run it should be achievable. I am not a huge fan of OTR and MTM. For OTR suits they never fit me properly even if a tailor works on it. With MTM, as a client you do have slightly more input on what kind of fabric type you want. However there is a ceiling to the amount of input your really have. The brand might only have a handful of fabrics you can chose from and the same is said about style details. Lastly, both OTR and MTM are still cut on big machines and the cut of the suit is still based on the mannequins on which the design was created so it won’t fit perfectly. Bespoke on the other hand allows you to chose from numerous fabrics and if you still not satisfied with the fabrics the tailor has you can request the tailor to order a particular fabric in. Also you have control over the style details and most importantly the suit is created around your proportions; therefore, it should fit assuming the tailor knows what he/she is doing. Lastly, in regards to FS’s statement that Tom Ford is probably higher quality then Anthony Sinclair is a comment I can’t get my head around. Higher quality is a subjective term that is different from person to person. For me Anthony Sinclair would be higher quality. First Sinclair’s suits actually fit. Secondly they are made of heavier fabric 11oz-13oz suggesting that they would wrinkle less and last more than a dozen wears. Thirdly, they are full canvassed also suggesting further durability. Finally, they are created by an individual who was trained to be a tailor and is not some fashion designer. The precision of handwork I’ve seen on Tom Ford is better than what I’ve seen on any English bespoke, though more recent examples of English bespoke I’ve seen are better than many of the older ones. If Tom Ford fits (and they have a number of different fits), then the fit benefit from bespoke is irrelevant. Tom Ford’s clothes have more shaping than most ready-to-wear, which makes a big different in the way it fits the body compared to other ready-to-wear, and a lot of adjustments can be done through made-to-measure. Cloth weight isn’t a concern through made-to-measure. And Tom Ford is fully canvassed. The construction inside a Tom Ford suit couldn’t be any better. The reason to go Sinclair over Tom Ford is if Tom Ford doesn’t fit and if you want Sinclair’s style over Ford’s. There are still boundaries with bespoke. You can’t go to Sinclair and get a Tom Ford style suit. Thanks for the additional info Matt. In the end Sinclair and Ford create very nice suits. I am no way hating against Ford, I am a fan of his and I do own some Tom Ford items. Furthermore, I am a big fan of the TV show Suits and I really enjoy the Ford suits worn by Mr. Macht as Harvey Spector.The reason why I prefer Sinclair over Ford is probably due to the fact that I prefer Connery’s films over Craig’s. 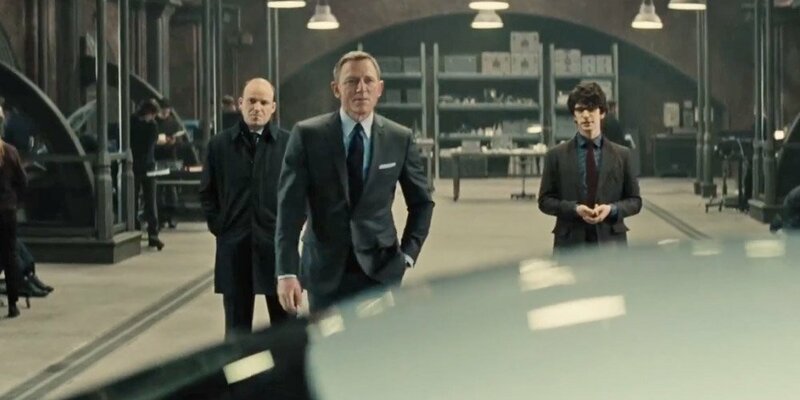 Also the poor fit of Craig’s suits in Skyfall and Spectre kinda ruins the Ford name. However the suits in QOS were well done. Matt which one is your preferred style? I prefer Anthony Sinclair’s suits, but I am also a big fan of Tom Ford’s suits as well when they fit well. I think they went a little too fashionable with the fit for Craig in the last two films. It looked a little to trendy for a man in his middle 40’s. I think they need to go back to the fit of Craig’s suits in QOS if Tom Ford is to continue in the Bond films. Connery always looked elegant and never too trendy, he was also wearing bespoke which is different to made to measure of Craig. When fitting properly Tom Ford is amongst the best out there. I love the padded shoulders and very suppressed waist, but I have seen off the rack new Anthony Sinclair’s and they are very elegant. The shoulders still soft and the waist smoothly suppressed. So I would wear either, they both have there benefits. “The precision of handwork I’ve seen on Tom Ford is better than what I’ve seen on any English bespoke, though more recent examples of English bespoke I’ve seen are better than many of the older ones”. Considers that until 60s,bespoke suits were not a luxury,and a good suit cut by a tailor cost less of a average ready to wear suit today. Matt, how deep would you say Craig ‘s turn ups are on his suits? I’m considering having a pair of trousers I purchased unfinished hemmed with turn ups and I like the depth of Craig’s (I’m marginally taller than him). I’d say Craig’s turn-ups are about 1 3/4 inch tall. This is purely opinion. I see Ford as riding the border between the older elegance and the newer rising influence of the working-class aesthetic that finds elegance effeminate and frightening. Derivatives of bowling shirts and shoes, affective casual look and in suits it carries on, given Ford’s overstuffed out of place fit, as if a young man’s first suit. I looked at the current line in his ads and they all appear a bit tight. It is just a look, we are not confined to some absolute standard, I don’t mean to be critical in that sense. A fine article Matt.